We awoke this morning with one very interesting thought: that we find it tremendously satisfying, to sit at a table which is set for us–then sinking our teeth into something unexpected, new and unexpectedly delicious. Something that we didn’t cook for ourselves. Whatever our inspiration, online this morning we found an article in the Huffington Post, about the joy that is derived–the actual psychological benefits–of cooking for someone else. Apparently, synapses fire; chemicals are dispensed and a sense of general well-being fills the grey organ in one’s head. Our layman’s psychological analysis here alludes to, but does not explicitly spell out–the deep spiritual joy that cannot be explained by a course in biochemistry. 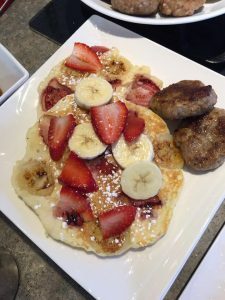 This is the satisfaction that’s experienced in the artist’s heart of our own Kate, who every morning is up with the proverbial birds: whipping, cracking, spreading, baking, frying and in general creating The Best Breakfast in Saratoga. Kate’s talents are congenital, for sure–she was born with her gift for inventing yummy food for her (delighted) parents and other fortunates. But then culinary school gave her the edge–the insider’s knowledge of food science, including the chemistry of the interactions of ingredients. Is it any wonder, then, that Kate’s morning offerings border on the magickal, as opposed to, say–fry-cookery? Her academic background, in concert with her considerable gifts for the culinary arts, come together intentionally. Her goal: to trip those aforementioned chemical reactions in our guests’ brains. But no, it’s more than that: Kate derives profound emotional satisfaction from seeing our guests, slowing down. Taking the time to spread the napkin on one’s lap. Smiling in anticipation, taking fork in-hand–and plunging, deeply, into the plate or bowl of hand-crafted joy that’s been placed before them. our guests’ role in this mutually-giving relationship is that–all they (you) are expected to do is sit, eat and smile. We invite you to stay with us in every season, for whatever reason. Celebration–getaway from the humdrum–reenactments–horse racing. Whatever your reason to be in Saratoga Springs, we invite you to stay at our intimate hostelry. Enjoy your night’s sleep in our exceptional beds. Then, we beseech Thee–give Kate the joy of cooking for you, of creating breakfasts that will motivate you down the hallway, and into our dining room, a/k/a: Roomful of Bliss. 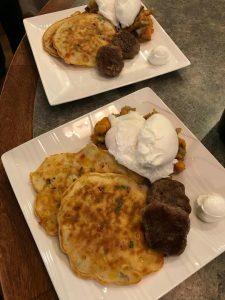 We guarantee, you may have a rush of memory, of your Mother’s own breakfasts, served with love–but this time, created by a chef whose every dish is influenced by the likes of Pepin, Puck or Garten. Come for the bed. Stay for the breakfast. Your brain–and soul–will thank you.